Even though the winter has been relatively mild, it's still a joy to see signs of spring. Spring flowers are some of the most welcome sights of all! Check your local Target for these tall metal vessels--reminiscent of French flower vases, aren't they? These are available in the One Spot. They cost $2.50 each. If your flowers aren't long-stemmed enough for the vase, never fear. A couple of common household items to the rescue! 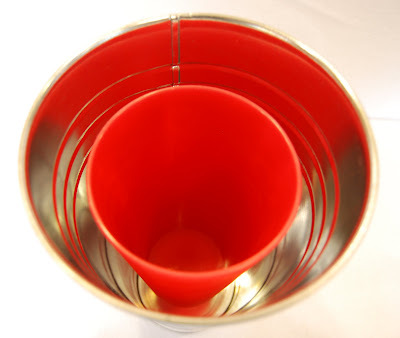 Place your short plastic cup upside-down in the bottom of the vase. See it way down there in the bottom? Fill your tall plastic cup with water and a couple of drops of bleach to make the flowers last longer. 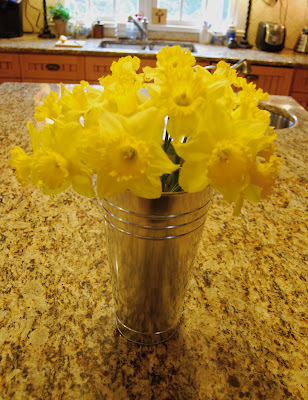 Snip your flower stems to be just long enough so that the blooms show above the top of the container. Voila! Now it's springy inside as well as outside! 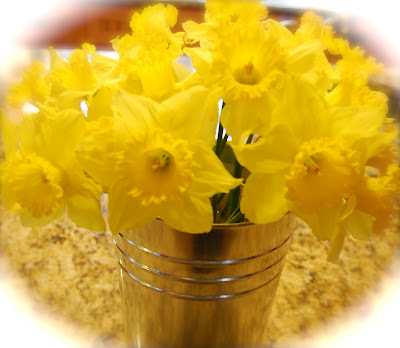 ~~What's your favorite spring flower? Do you like the best outside or do you cut them and bring them in? My sign of spring flower is ... the primrose. Great tip. Love your metal vase and your flowers, too. My favorite spring flower is a pink peony. I can't wait for the lilacs to bloom!